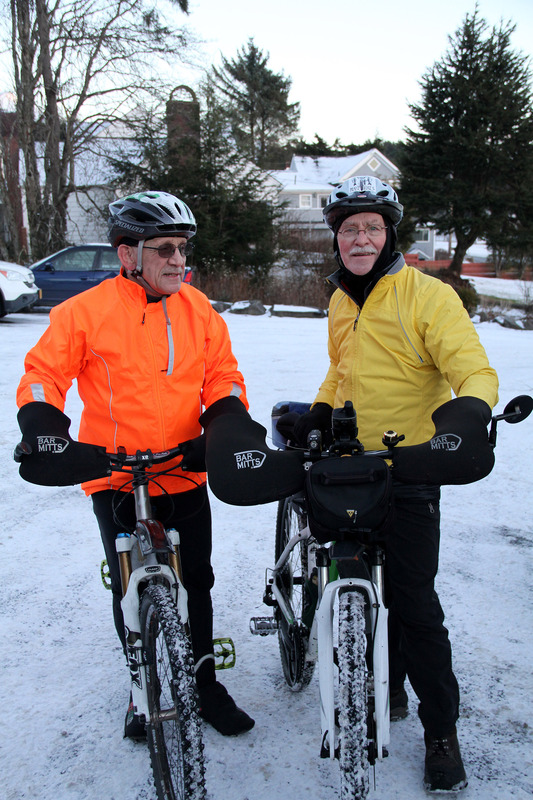 Sitka cyclists are hardy souls, and many of us ride our bikes all year round, not just in the summer. 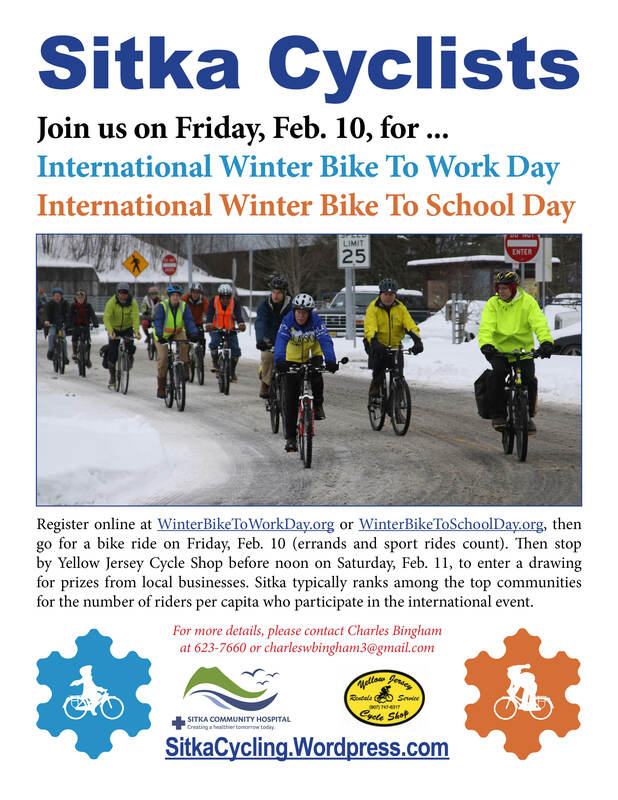 Now Sitka cyclists can ride and win prizes by participating in the fifth annual International Winter Bike To Work Day on Friday, Feb. 10. This year also is the second annual International Winter Bike To School Day on Feb. 10, so watch out for younger cyclists. Our celebration of winter cycling in Sitka will be simple. First, go to the International Winter Bike To Work Day website, http://winterbiketoworkday.org/, and commit to riding to work on Friday, Feb. 10 (people who work at home can use a bike ride for errands or sport as their bike commute for the day). Then, on Friday, Feb. 10, during your bike commute, stop by the Yellow Jersey Cycle Shop (329 Harbor Dr.) between 10 a.m. and 6 p.m. to enter your name and phone number in a contest to win prizes, including a gift card from Yellow Jersey Cycle Shop and a high-visibility jacket from Sitka Community Hospital. This is the fifth year of International Winter Bike To Work Day, which started when several communities in Canada challenged each other to see which one could have the highest number of bike commuters. In 2014 the event expanded outside Canada, and Sitka and Anchorage hosted events along with several other communities around the world’s polar regions. Sitka ended up having the second-highest number of participants per capita, trailing only Oulu, Finland, in 2014. We also were the smallest community to have at least 20 participants. In 2015, there were even more winter cyclists participating around the world, and Zagreb, Croatia, became the first community to have more than 1,000 cyclists participate. Zagreb also had the most participants in 2016 (Sitka finished 107th overall, even finishing ahead of some large cities). For students, go to the International Bike To School Day website, http://winterbiketoschoolday.org/, and commit to riding to school on Friday, Feb. 10. All of Sitka’s public schools should be listed on the site (including the University of Alaska Southeast Sitka Campus). Teachers can do a quick, 30-second survey about how students got to school to help their school’s Bike-Walk-Roll Score. We are still gathering door prizes, and businesses or people wanting to donate door prizes to the event can contact Charles Bingham at 623-7660 or charleswbingham3@gmail.com for more information. We are looking for items such as gloves, reflective safety vests, water bottles, helmets, etc., although some businesses donated gift cards, bike books, or non-biking and non-winter items in past years. 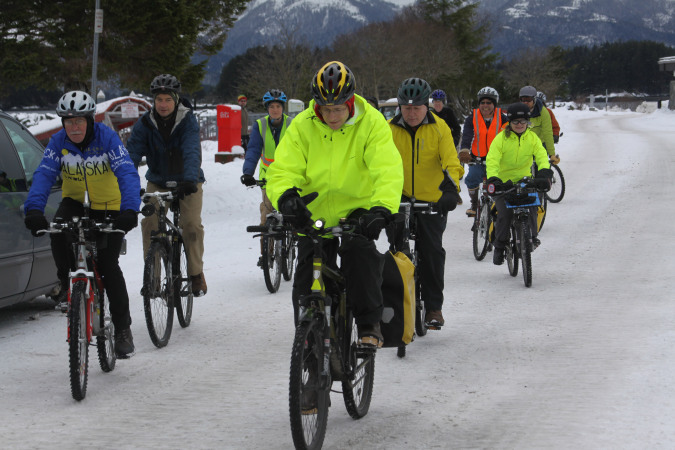 Doug Osborne, front, leads cyclists during the Sitka Winter Cycling Celebration in January 2012. The Sitka Bicycle Friendly Community Coalition will meet from noon to 1 p.m. on Wednesday, Jan. 25, at the Larkspur Café. The monthly meeting is open to everyone interested in making Sitka an even better town for cyclists of all ages. Topics include the recent Bicycle Friendly Business award renewal for the SouthEast Alaska Regional Health Consortium (SEARHC) and discussion of how we can get other Sitka businesses to apply, planning for the upcoming International Winter Bike to Work/School Day events on Feb. 10, and planning for a “Ride ‘Em All” program this summer to encourage cyclists to ride every road and trail in Sitka. The League of American Bicyclists on Dec. 21, announced that the Sitka campus of the SouthEast Alaska Regional Health Consortium (SEARHC) has been awarded a renewal of its 2011 Bronze level Bicycle Friendly Business award. SEARHC is the only Alaska organization among the 42 new and returning businesses nationwide to earn an award during the Fall 2016 cycle. 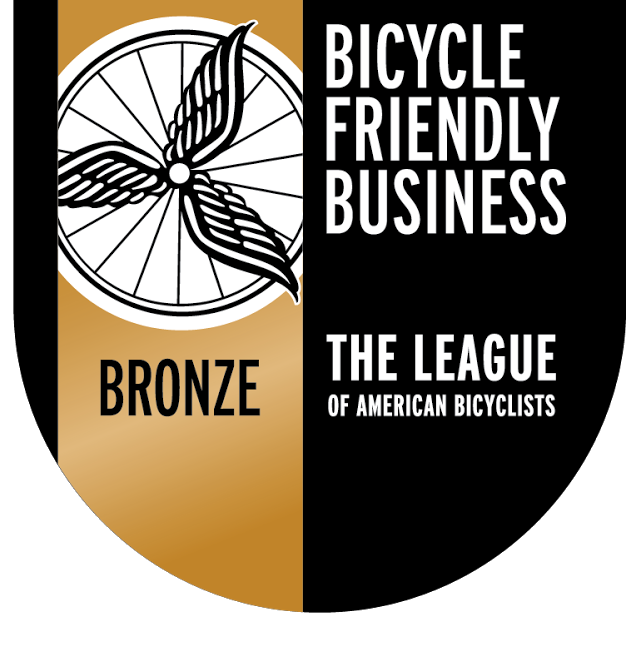 There now are 1,265 Bicycle Friendly Businesses in 49 states at the Platinum, Gold, Silver and Bronze levels (there also is an Honorable Mention level not included in the total). Since the Bicycle Friendly Business (BFB) program started in 2009, there have been 11 businesses in Alaska to earn the honor. SEARHC is the only one of the group located outside of Anchorage. Besides SEARHC, the current BFBs in Alaska are — the Alaska Native Tribal Health Consortium (gold), Southcentral Foundation (gold), CRW Engineering Group LLC (silver), ECI/Hyer Inc. (bronze), Green Star Inc. (bronze), Kittelson & Associates Inc.-Anchorage (bronze), Providence Alaska Medical Center (bronze), R&M Consultants Inc. (bronze), REI Anchorage (bronze) and Alaska Pacific University (honorable mention). The Bicycle Friendly Business program honors those businesses committed to making their businesses more bike friendly for employees and customers. These organizations come from a wide range of industries, such as health care, manufacturing and government. They also range from large Fortune 50 company headquarters to small mom-and-pop businesses with only a handful of employees. The Bicycle Friendly Business program provides a free roadmap for businesses wanting to make their organizations more friendly to bikes. Businesses have to complete a lengthy application that includes information about the number of bike commuters, facilities available for them (such as racks, showers and lockers), education programs and ways the business connects with the local bicycle community. SEARHC is Sitka’s largest employer with about 550-570 employees in town, and SEARHC is the region’s largest private employer with just more than 1,000 total employees. The SEARHC Sitka campus took an active role in Sitka’s 2008 application to become the first Bicycle Friendly Community in Alaska (Bronze), and also helped in Sitka’s 2012 (Bronze) and 2016 (Silver) renewal Bicycle Friendly Community applications. SEARHC promotes healthy and safe cycling to its employees and the community through its health promotion, injury prevention and employee wellness programs. Winners of the Bicycle Friendly Business award are allowed to use the designation for the next four years. To learn more about the BFB program, go to http://bikeleague.org/business. Sitka businesses interested in applying can contact Charles Bingham of the Sitka Bicycle Friendly Community Coalition at 623-7660 or charleswbingham3@gmail.com. The BFB program is part of the League of American Bicyclist’s larger Bicycle Friendly America program that also includes the Bicycle Friendly Community, Bicycle Friendly State and Bicycle Friendly University programs. Alaska now has three Bronze-level or higher Bicycle Friendly Communities — Sitka (Silver), Anchorage (Silver) and Juneau (Bronze), with Fairbanks earning an Honorable Mention designation in November 2016. The University of Alaska Fairbanks (Silver) is the only Bicycle Friendly University in the state. In 2015, Alaska ranked 41st in the Bicycle Friendly State rankings, up from 43rd in 2014.